Arrow introduces the Longbow Hunters and plays around with changing team dynamics during Oliver’s absence. One of the best things about a long running TV series is that years of character development allow for a rich assortment of supporting characters capable of carrying their own stories. Most of the characters in this show have been around for a while with Felicity and Diggle being the longest serving so there’s enough history to base individual plots on. It’s definitely a good thing as it means less reliance on Oliver Queen as a central figure and allows for more complex character driven storytelling. 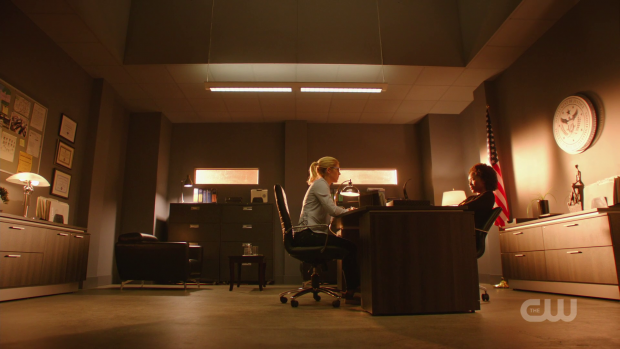 Last week was the beginning and the end of the Felicity and William witness protection story. Instead of looking over her shoulder terrified that Diaz would find her at any moment she is now taking a more proactive approach the problem and trying to find him first. She is completely single minded in her desire to find Diaz to the point that she’s willing to risk compromising friendships in order to get revenge on him. It’s an understandable position for her to take though it does call back to more problematic Felicity characterisation in previous seasons where she was seemingly willing to do just about anything to protect Oliver no matter who might stand in her way. There are a few examples of that in this episode. For example she constantly encourages Curtis to abuse the resources at his disposal in order to help her showing a casual disregard for the fact that Curtis has a job that he likes and can do a lot of good with. Curtis does refuse to cross any lines for her though he stops short of holding her accountable for the way she behaves outside of berating her for what she is trying to do. Diggle is the one to call Felicity out on the way she behaves after she ignores his instructions and compromises a promising lead. He’s understandably upset with her because she went behind his back and acted recklessly. From here we get to the root of this obsession through a really good conversation between Felicity and Duffle that firmly established them as being on opposite sides of the same issue. Diggle’s position at A.R.G.U.S. is a really good fit for him as he is able to continue doing what he thinks is the right thing within the boundaries of the law. This turns out to be an important detail when he explains to Felicity why he didn’t take Oliver’s place at Green Arrow. After seeing how being a masked vigilante impacted his life as well as the lives of Felicity and William he decided that it wouldn’t be fair to put his family through that. It’s perfectly valid as reasons go and it’s hard to deny that Oliver has dealt with intense hardship as a direct result of his exploits as Green Arrow so Diggle not wanting to put his family at risk through assuming that identity is a perfectly reasonable thing to do. Working for A.R.G.U.S. gives him a degree of safety in the sense that he has a government agency backing him op and offering protection. This conversation makes enough of a difference for Felicity for her to try doing things Diggle’s way for a while. The train sequence is really well put together and a good example of something that is familiar while also addressing how much has changed. It’s a smart tactic as there are certain expectations that come from fans of the show that are still being met but a lot has changed so showing this through a somewhat standard infiltration sequence is a good way to explore this. There are a number of well deployed character flourishes throughout this sequence, particularly where Felicity is concerned. It had already been established that she’s highly motivated to bring down Diaz but his attack on her last week combined with everything she has lost because of him causes her to freeze when she finds out that he’s on the train. She hesitates when asked to do something and has to be snapped out of it by Curtis. Later she almost disobeys Diggle’s instruction because it means letting Diaz get away in favour of accomplishing the actual missing. It’s a dangerous obsession that Felicity has cultivated and it’s clearly affecting her objectivity. Her later conversation with Diggle where she acknowledges that his way of doing things is valid works really well because it takes full advantage of the history that exists between these characters. Felicity has calmed down enough to respect Diggle’s point of view and understands the reasoning behind his decisions so it’s a huge step forward for her in that sense. The other component to the conversation is that she can’t work with him because of the differences in their objectives so there is a further divide created within what used to be Team Arrow by this. Felicity going to Agent Watson for help makes a lot of sense given her current mindset and adds extra complexity to the goings on in this season. The introduction of the Longbow Hunters is certainly a memorable one. 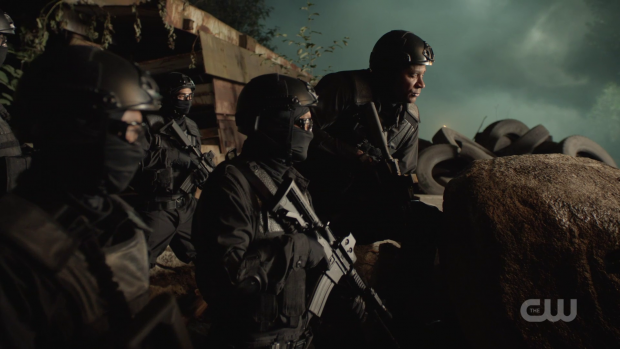 Red Dart (Holly Elissa), Silencer (Miranda Edwards) and Kodiak (Michael Jonsson) are uniquely formidable while being even deadlier as a group. Amusingly none of them are equipped with longbows but I suspect the group’s history will be explored to explain what the name means to them. For now they seem to be taking on the role of charismatic recurring henchmen who can equal if not eclipse Team Arrow in skill level. So far Red Dart is the most engaging thanks to her introduction showing that she knows how to manipulate people. For the other two it helps that they have a unique gimmick that will make them easier to identify and remember. Their unique skills allow for some really cool action. The train sequence where Diggle takes on Kodiak before having a really satisfying brawl with Diaz where he comes out on top is a great example. Dinah and Evil Laurel taking on Silencer with her shield that protects from sonic screams is brief but impressive as well. Having them work together to take down the shield is an obvious yet effective reminder that none of the characters are at their best when alone. Dinah and Evil Laurel’s interactions make for generally entertaining viewing though it’s difficult to be fully invested in it because I’m always assuming that Evil Laurel is playing some kind of long con and will emerge as a villain before long. Still, the contempt between them is fun to watch and well played by both actors. Dinah showing her ability to be detached and professional around the woman who killed Vince because she knows that the city needs a DA is a really nice touch that tells the audience everything they need to know about Dinah’s ability to do her job. Oliver in prison continues to be an engaging story. It must have been a difficult prospect having the main character distanced from the rest of the cast for multiple episodes but the writers are certainly making the best of it. Last week got around this somewhat by having a scene with Diggle and a scene with Felicity but this week he’s pretty much on his own outside of a fast friendship with Stanley who acts as a temporary Overwatch of sorts. After last week’s events Oliver’s mindset has shifted from keeping to himself to making alliances that will help protect his family. Brick is having none of it initially and demands proof that Oliver can be trusted by getting rid of a troublesome guard. The obvious way to do that is to kill him but Oliver won’t do that and pledges to do it his way. He embarks on a futile investigation trying to dig up dirt on him which fails so he makes it look like the guard stabbed him instead which is enough to get him out of the way. There is a dubious morality at play as Oliver is framing an innocent man to ingratiate himself with criminals but as far as compromised principles go it’s a good way for Oliver to do that without going too far. Whether he will be held accountable for befriending criminals remains to be seen but for now it’s understandable that Oliver would see this as necessary. 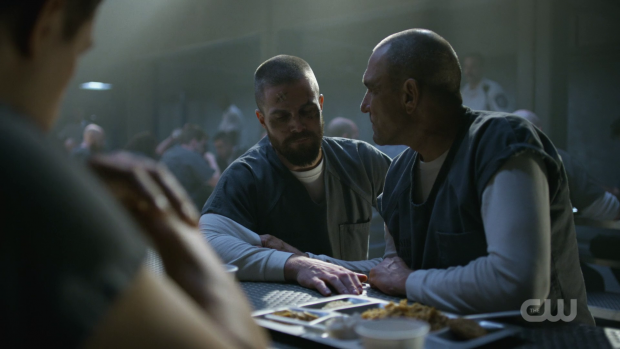 I find all of this encouraging as Vinnie Jones is an engaging presence who has a fun dynamic with Stephen Amell. The flashforwards continue to be compelling because they are used sparingly and deepen the mystery in really organic ways. Stories like this are often so artificially cryptic with characters being needlessly vague because the writers know that audiences are picking apart every word that’s said looking for clues. 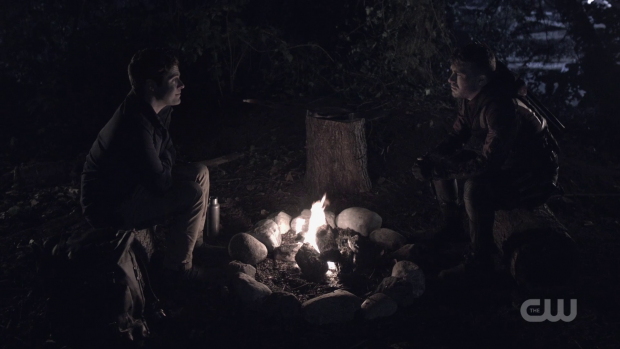 There’s an element of that here but the conversations between Roy and William don’t contain any dialogue that explains things they should already know. Roy isn’t entirely clued up on what happened but knows enough to not need everything explained to him. This means that we learn everything naturally and the dialogue is ambiguous enough to allow the audience to infer different things. It could be that Oliver or Felicity are dead though that I don’t think that’s the case and I’m encouraged by the island portion of the story being over so that future episodes can feature Roy and William exploring the future of the Arrowverse. There’s a lot to unpack for both of those characters as Roy has baggage that he refuses to talk about at this point which suggests that something terrible happened on his quest with Thea that caused him to turn his back on the world. Another strong episode that introduces some engaging new villains and plays around with the character dynamics to create something familiar yet new. 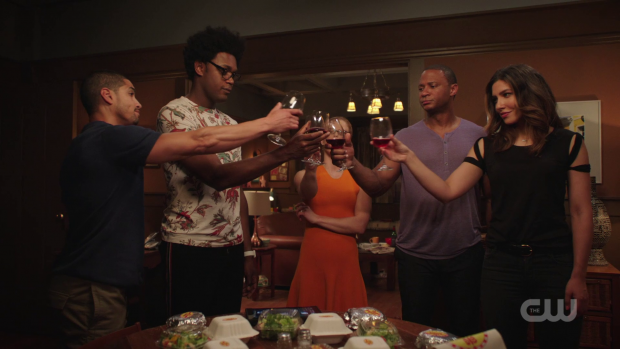 Felicity’s obsession with finding Diaz puts her at odds with Diggle when she shows little respect for his position at A.R.G.U.S. and expresses her disappointment that he didn’t take up the Green Arrow mantle. Diggle and Felicity’s conversations are some of the best material in this episode and Diggle’s justification for his decision not to become the new Green Arrow makes complete sense to the point that it even calms Felicity down to some degree. After trying to work together like old times Felicity realises that their objectives aren’t compatible and goes to Agent Watson for help instead. At this point Felicity is too far gone to realise that bringing Diaz down won’t secure Oliver’s prison release and it’s interesting to see how single minded she is. The Longbow Hunters are a great addition so far. They seem to basically be recurring henchmen but they have a lot of personality as well as a unique gimmick that makes them easy to identify. They greatly enhance the action sequences with their presence and I’m interested to learn more about them as an organisation. Dinah and Evil Laurel are fun to watch bounce off each other though it’s hard to be truly invested in this as I’m still assuming that Evil Laurel is up to some sort of long con. Oliver in prison continues to work really well. The compromised morality to protect his family plot is fairly standard but allows for some good work from Vinnie Jones and shows Oliver being really creative in befriending Brick without going too far. William and Roy in the future is intriguing as the characters have natural sounding conversations where neither of them explain information that they should already know. The mysteries around what happened in the intervening years develop organically and the speed of plot movement is really encouraging.